The two basic types of financial markets include exchange and over-the-counter markets. We can enjoy the OTC Forex trading using modern MetaTrader and MetaEditor tools, which are constantly being further improved. In addition to trading automation, these tools enable comprehensive testing of trading algorithms using historical data. What about using our own ideas for exchange trading? Some exchange trading terminals have built-in programming languages. For example, the popular Transaq terminal features the ATF (Advanced Trading Facility) programming language. But, of course, it cannot be compared with MQL5. Moreover, it does not have any strategy testing functionality. A good solution is to obtain exchange data and optimize trading algorithms in the MetaTrader strategy tester. This can be done through the creation of custom symbols. The process of custom symbol creation is described in detail in the article Creating and testing custom symbols in MetaTrader 5. All that is needed is to obtain data in the CSV (TXT) format and import the price history following the steps described in the article. The format that we need "yyyy.mm.dd" is not available. So, finam.ru provides a large variety of formats, bot does not have the one we need. Furthermore, there a lot of other exchange resources. Formats provided by other sites may also be inappropriate. We need a certain order of data. However, quotes can be stored in a different order, for example, Open, Close, High, Low. Therefore, our task is to convert data provided in a random order and different formats into the required format. This will provide an opportunity to receive data for MetaTrader 5 from any resources. Then we will create a custom symbol based on the received data using the MQL5 tools, which will enable us to perform tests. There are a couple of difficulties connected with the import of quotes. The exchange supports spread, Ask and Bid. However, all these values exist only at the "moment", in the Market Depth. After that only the deal price is written regardless of its execution price, i.e. ask or bid. We need the spread value for the terminal. Here a fixed spread is added, because it is impossible to restore the Market Depth spread. If the spread is essential, you can simulate it somehow. One of the methods is described in the article Modeling time series using custom symbols according to specified distribution laws. Alternatively, you can write a simple function presenting the dependence of spread on volatility Spread = f(High-Low). Here we need to set ASK and BID in addition to LAST. Data is sorted with millisecond precision. The exchange provides only a stream of prices. Data in the first page are more like dividing a large lot into pieces. There are no ticks, in Forex terms. This can be Bid, Ask or both Bid and Ask at the same time. In addition, we need to artificially rank deals by time and add milliseconds. Thus, the article deals not with the data import, but with data modeling, just like the article mentioned above. Therefore, not to mislead you, I decided not to publish tick importing application operating according to the principle of ASK=BID(+spread)=LAST. Spread is significant when working with milliseconds, so in testing we need to choose an appropriate modeling method. Amending of the tick importing code after that will take a couple of minutes. It is only necessary to replace the MqlRates structure with MqlTick. The CustomRatesUpdate() function needs to be replaced with CustomTicksAdd(). The next point is connected with the inability to consider all possible data formats. For example, numbers can be written with separators 1 000 000 or with a comma used instead of a point for decimal separator like 3,14. Or even worse - when both the data separator and the decimal separator are a dot or a comma (how do you distinguish between them). Only the most common formats are considered here. If you need to deal with a non-standard format, you will have to process it yourself. In addition, there is no tick history on the exchange — it only provides deal volumes. Therefore, in this article we use exchange volume =VOL=TICKVOL. The article is divided into two parts. Part one features the code description. It allows you to familiarize with the code, so that later you will be able to edit it for operations with non-standard data formats. Part two contains a step by step guide (user manual). It is intended for those, who are not interested in programming but only need to use the implemented functionality. If you operate with standard data formats (in particular, use the finam.ru website as a source), you can immediately proceed to part 2. Only part of code is provided here. The full code is available in the attached file. First, let us enter the required parameters, such as position of data in the string, file parameters, symbol name, etc. If the required format is not available, add it. Then open the source file. For the convenient editing of formatted data, I suggest saving them in a CSV file. At the same time, the data should be written to the MqlRates structure to enable the automatic creation of the custom symbol. The source file must be saved to the MQL5/Files directory. The SkipString external variable presents the number of lines in the file header to skip. To be able to use spaces and tabs as separators, we open the file with the flag FILE_TXT. Then we need to extract data from the string. The location is specified in input parameters. Numbering starts from 1. 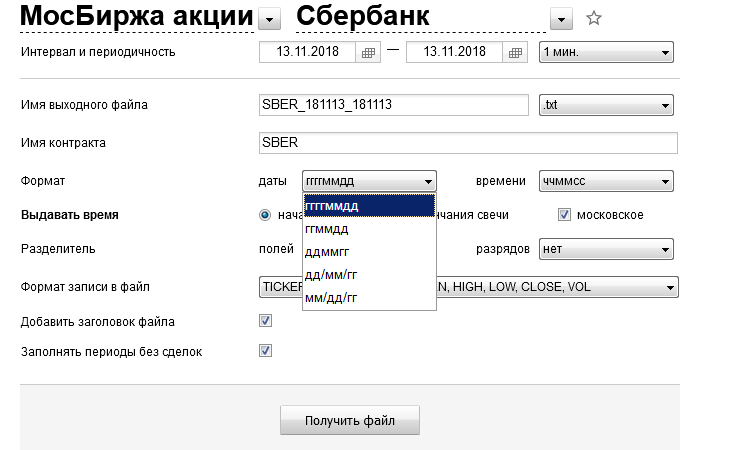 Let us use Sberbank shares quotes as an example. Here the date position is 1, time is 2, etc. SkipString=1. To parse the string, we could use the StringSplit() function. But it is better to develop our own functions, for a more convenient monitoring of errors in the source file. Data analysis can be added to such functions. Although, using the StringSplit() code would be easier. The first function which finds data boundaries receives the string, the separator and the position. Boundaries are written to the a and b variables which are passed by reference. If the required format is not available (for example a date like 01 January 18), it should be added. Here a check is performed of whether the received data corresponds to the required format (in case of an error in the source file) if(StringLen(res)!=10) res="";. I understand that this is not a thorough check. But data analysis is not an easy task, so a separate program would be needed for a more detailed analysis. In case of an error, the function returns res =,"" and the appropriate line is then skipped. The following conversion is provided for formats of type ddmmyy, in which the year is written as two digits. Values >=70 are converted to 19yy, values less than that are converted to 20yy. After format conversion, we write data to appropriate variables and compile a final string. If an error is found in functions SearchBorders, DateFormat or TimeFormat, the string is skipped and its sequence number is written using the Print() function. All enumerations and format conversion functions are located in a separate include file, FormatFunctions.mqh. Then the resulting string is formed and written. Data are assigned to appropriate elements of the MqlRates structure. Now everything is ready for creating a custom symbol. In addition, we have a CSV file, which can be easily edited directly in MetaEditor. 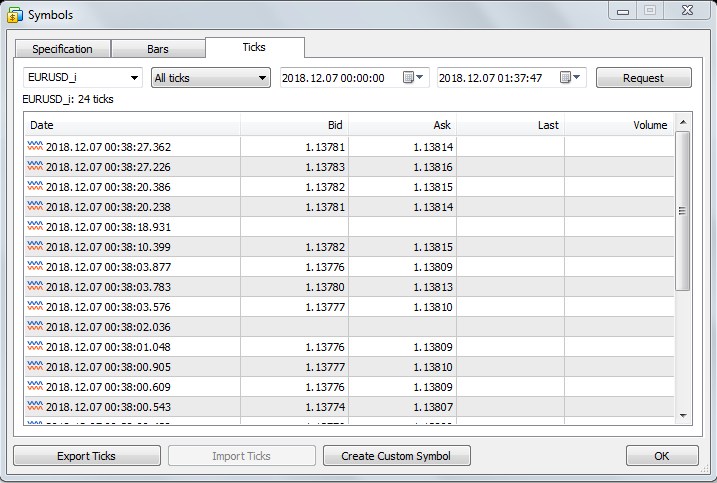 Based on the CSV file, we can create custom symbols using standard methods in the MetaTrader 5 terminal. Now that all the data have been prepared, we only need to add the custom symbol. Quotes are imported using the CustomRatesUpdate() function, which means that the program can be used not only for symbol creation, but also for the addition of new data. If the symbol already exists, CustomSymbolCreate() will return -1 (minus one) and program execution will continue, so quotes will be updated through the CustomRatesUpdate() function. The symbol is displayed in the MarketWatch window and is highlighted in green. When testing a symbol, we may need to configure its characteristics (specifications). I have written a separate Specification include file, which enables the convenient editing of symbol properties. In this file, symbol properties are set in the SetSpecifications() function. All symbol properties from the ENUM_SYMBOL_INFO_INTEGER, ENUM_SYMBOL_INFO_DOUBLE , ENUM_SYMBOL_INFO_STRING enumerations ate collected here. The following parameters are uncommented for testing purposes: minimum volume, volume step, price step, point size, which are the most necessary characteristics. This characteristics are typical of Sberbank stocks. The set of properties and their characteristics differ for different symbols. This would be a good approach, if we didn't have to recompile the code each time we need to set the desired properties. It would be more convenient if this could be done just by entering desired parameters. Therefore I had to change the approach. Symbol properties will be provided in a plain text file Specifications.txt, which can be edited manually for each new symbol. This does not require the recompilation of the source code. Two more functions are added for the cases if the user leaves spaces or tabs when editing, StringTrimLeft() and StringTrimRight(). The full code is available in the include file PropertiesSet.mqh. 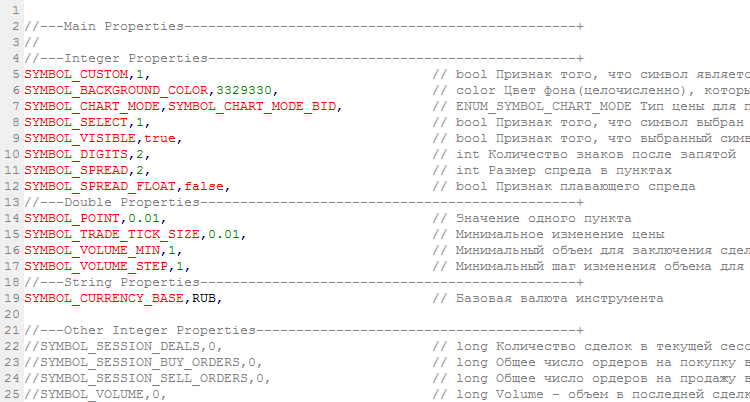 Now all the symbol properties are set through the attached text file, while no additional re-compilation is needed. You may check both code variants, which are attached below. The first variant which requires the property setting via an include file is commented out. An event handler has been created for the OK button. Now almost the entire code of the program described above is moved to this event handler. External parameters become local variables. This version has a larger implementation, so if you need to edit the code, you should work with the input version. This part features a step-by-step description of actions required for the creation of a custom exchange symbol. This guide can be used when available quotes have any of standard formats and you do not need to edit the code. For example, if the quotes are obtained from the site finam.ru site. If the quotes are in some non-standard formats, then you should edit the code described in Part 1. So, we have a source file with exchange quotes of a financial instrument. Suppose, we have obtained it from the Finam site as described at the article beginning. Do not forget that we need the quotes of the one-minute timeframe. Two data import options are described in the article. You may use either the CreateCustomSymbol script and the CreateSymbolPanel Expert Advisor, which has the inputs panel. Both EAs perform exactly the same. For example, let us consider operation with the inputs panel. In the examples provided here, we use Sberbank shares quotes from Moscow Exchange. The quotes are attached below, in the sb.csv file. First of all, we need to save the quotes file to MQL5/Files. This is connected with the MQL5 programming concept, due to which operations with files are strictly controlled for security reasons. The easiest method to find the desired directory is to open it from MetaTrader. 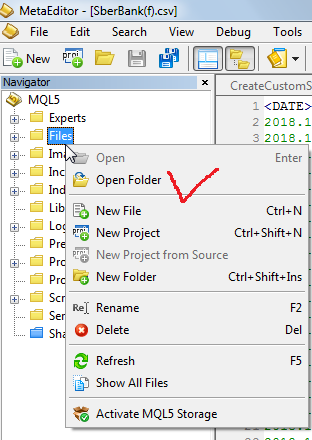 In the Navigator window, right-click in the Files folder and select "Open folder" from the context menu. The source data file should be saved to this folder (the location of program files is described in the Files chapter below). The file can now be opened in MetaEditor. Add Specifications.txt to the same folder. It sets symbol properties. The data should be transferred to the panel. Fixed spread in points is used in this version, so floating spread is not modeled. Therefore, you should enter an appropriate spread value here. Write the full file name including the extension. Now, before you click "OK", specify the necessary symbol specifications. 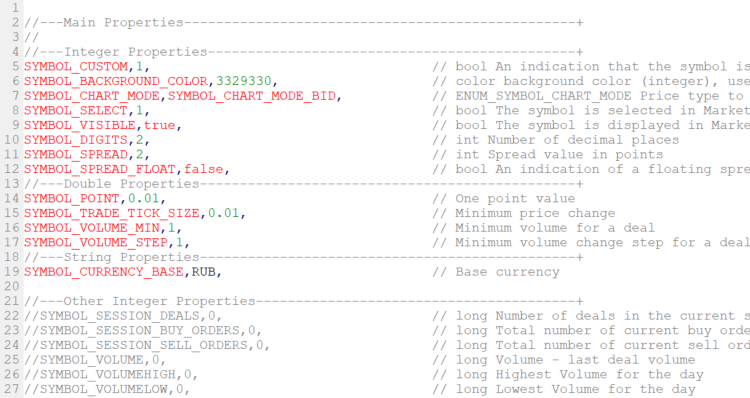 They are available in the Specifications.txt file which was earlier placed in MQL5/Files. It is very convenient to edit the text file in MetaEditor. The main reason is data highlighting supported in MetaEditor. If you cannot understand any of the properties, hover the cursor over it and press F1. Properties are highlighted in red and values are shown in green. The commented properties (//) which are not used are shown in gray. Note that commas are used for data separation. Do not delete properties while editing. In order to avoid errors, you should keep the existing format. To edit properties, uncomment the desired ones (remove "//") and then set the appropriate value. A minimum set of properties given set in the attached file: price step, point value, minimum lot, etc. All these characteristics (in the source file) are required for Sberbank stocks on Moscow Exchange. Different characteristics are required for other financial instruments, therefore you need to edit the properties. The minimum required set of properties is located at the very beginning of the file. 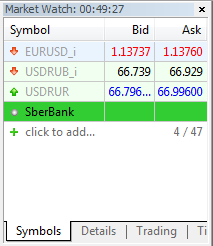 Usually, stock prices have 2 decimal places (SYMBOL_DIGITS), while the point value is equal to 0.01 rubles. 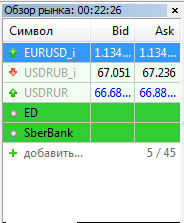 The number of decimal places in stock futures prices is 0 and point value is 1 ruble. See specifications at moex.com. Once you have set all the required properties, click OK. The created custom symbol will appear in the navigator window. In my example, it is highlighted in green. Everything is fine, so the custom symbol can now be tested in the Strategy Tester. Custom symbol settings is performed similarly to a standard symbol. An important point here is to properly configure symbol specifications. Everything works as expected. If you need to add new quotes or change the properties, simply repeat the described actions for the already existing symbol. If the specifications have not changed, click OK without editing the properties. In this article, we will apply the probability theory and mathematical statistics methods to creating and testing trading strategies. We will also look for optimal trading risk using the differences between the price and the random walk. It is proved that if prices behave like a zero-drift random walk (with no directional trend), then profitable trading is impossible. The article considers applying the separate optimization method during various market conditions. Separate optimization means defining trading system's optimal parameters by optimizing for an uptrend and downtrend separately. To reduce the effect of false signals and improve profitability, the systems are made flexible, meaning they have some specific set of settings or input data, which is justified because the market behavior is constantly changing.